The global James Dyson Awards continues to provide a stage on which young inventors can strut their stuff. The international judges are now reviewing this year’s entries in the lead up to the announcement of the 15 finalists on October 18. One of the entries that was under consideration is the Crawl from Kieran John. It is a pneumatically powered motorized platform designed to improve the efficiency of power line installation and servicing. Aimed at metropolitan electricity services, the Crawl is designed to replace the insulated truck-mounted booms currently used to raise linespeople up to overhead power lines. 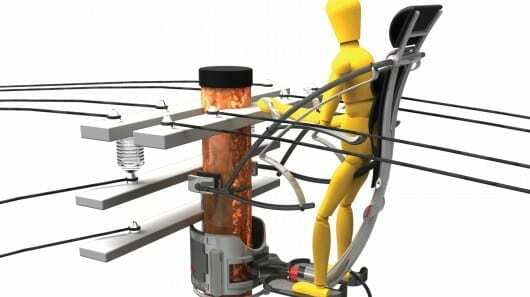 It consists of platform that clamps around a utility pole and lifts a linesperson up using a climbing mechanism powered by a pair of 300-watt pneumatic motors driven by an air compressor. It has the ability to rotate around to avoid obstacles as it ascends and features a leg and shoulder harness to securely hold a person as well as a perch seat to let them rest their legs. The controls are located at the end of the armrests while outer bars enclosing the linesperson protect them from coming into direct contact with the overhead wires. The device also weighs 30 kg (66 lb) and folds down for storage and transportation on smaller trucks than the 8-tonne vehicles used to carry the truck-mounted booms currently in use. John says helps make it cheaper and more convenient than existing systems.